In the closest of shaves, the Geotherm crew of Brett Hobson and Billy Lusty have been crowned new NSW 12ft skiff champions following six races held over two full weekends on either side of the Sydney Harbour Bridge. 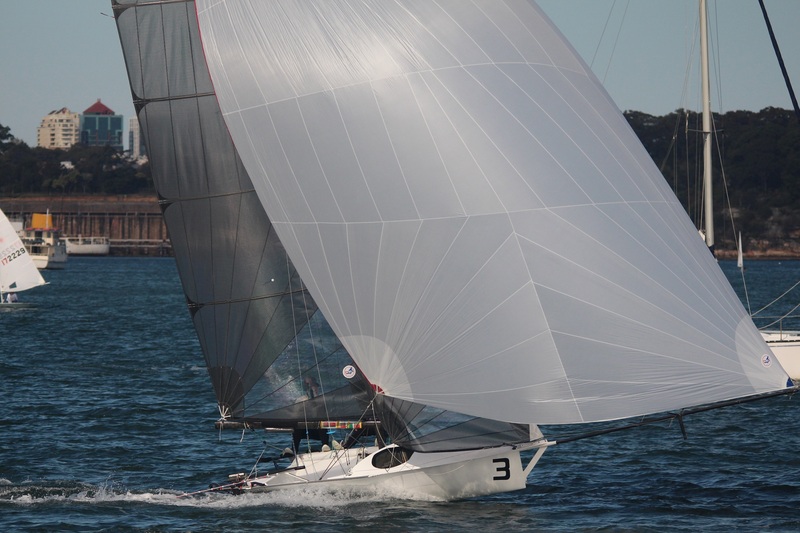 Geotherm’s crew had to be at their best to defeat defending five-time NSW champion and six-time Interdominion champion, Nick Press and his new crew Andrew Hay on Sydney Sailmakers. Under pressure, Geotherm’s crew was brilliant, finishing off the Championship with two bullets to claim the title by one point. Hobson, from Abbotsford, also broke in a new crew this season in 18 year-old Lusty from Berowra. With different crew members, Hobson has won the NSW title three times previously. He was coming to grips with their latest win, ahead of the major Interdominion Championship to be held in Auckland in January – the one everyone wants to claim. “We are a little surprised,” Hobson said this morning, after going into the weekend’s three races trailing Sydney Sailmakers by three points. However, Hobson and Lusty kept their cool, aware that Gladesville sailor Press is at his best and dangerous under pressure. Races 4, 5 and 6 were hosted by Lane Cove 12ft Sailing Skiff Club and held on the Lane Cove and Parramatta Rivers between Goat Island and Gladesville Bridge on the weekend. Hobson said Saturday’s race was difficult. “There were big holes in the course. It was patchy with gusts up to 18 knots at times. We struggled – like everyone did,” he said after finishing that race second to Press. Two races were sailed yesterday afternoon, and Geotherm won both. It was not straightforward though, when boats crossed the start line early and the general recall signal brought them back. “We waited for ages for the start and I had to keep my nerves under control,” Hobson admitted, knowing Press and Hay would be on their hammer. “I decided to just concentrate on what we did and it paid off,” said the new champion, adding the east/nor’ easterly winds of 12-15 knots provided better sailing than the previous day. The Championship was touch and go between Geotherm and Sydney Sailmakers, while third and fourth places see-sawed between Lincoln Crowne (Jonathon Temple/Richard Jones) and Big Foot Custom Trapeze Harnesses (Murray Press/Scott Lanham), which finished in that order. Kirribilli last weekend, in the area bounded from Garden Island to the Sow and Pigs reef off Watsons Bay. Sixteen crews took part. Sydney Sailmakers narrowly won the opening race from Geotherm by 28 seconds, with Lincoln Crowne in third place. In Race 2, the consistent Sydney Sailmakers finished on top of the podium again, with Lincoln Crowne second by nearly one minute. Big Foot Custom Trapeze Harnesses (Murray Press/Scott Lanham) was third, Geotherm finished fourth. Hobson and Lusty got their mojo back in the third race, sailed last Sunday, and in a thriller to the end, beat Press and Hay to the finish line by a mere nine seconds to claim that race. Big Foot was third and Lincoln Crowne fourth. The top four crews have had a stranglehold on the class for some time and props to Murray Press, father of Nick, now 63 years of age and still teaching the youngsters how it’s done. Hobson and Lusty, as new NSW champions, will have their names engraved on the Morna Cup, while the handicap winners, Jack Winning, now in his mid-sixties, and crew Brett Phillips (Chapman High Performance Sailing) will see their names on the Captain Dodwell Trophy. Jonathon Temple won the NSW Veteran Champion, and his name will be engraved on the Services Memorial Cup. Next on the agenda is the 56th Interdominion 12ft Skiff Championship, to be hosted by Auckland Sailing Club from 6-9 January. It is the ‘world championship’ of 12ft skiff sailing, hosted each year by Australian and New Zealand in turn. It is rare to see the visitors win away from home, but all will be doing their level best to overcome the strong Kiwi field. Top of the Australian contenders are the new NSW champions, Hobson (who won the Interdominion in 2009) and Lusty, along with the Press/Hay combination. Press senior and Lanham will also be there. Joining them are Cunning Stunts (Lachie Paramor/DuncanCampbell), Skoll (Peter Polec/Rob Joyce), Slippery When Wet (John Williams/Macca Paton), The Bird (Dave Lusty/Glenn Farquhar), Ghetto Sled (Richard Billett/Paul O’Malley Jones), Squid (Terry Ellis/Brad Madders), The Wingman (James Fleming/Jono Andersen), Tank Girl (Ben Guymer/Shaun Thompson) and Hempel Yacht Paints to be skippered by Michael Spies fresh from his Rolex Sydney Hobart campaign and crewed by Robbie Polec. 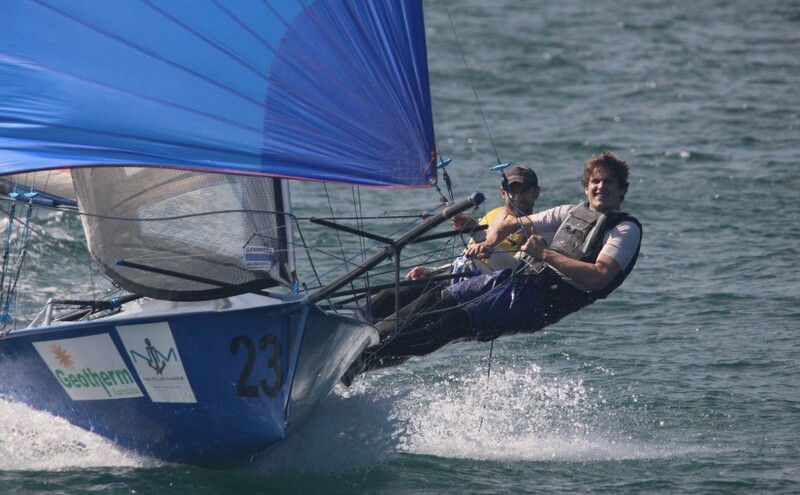 This entry was posted in News, Race Reports on December 7, 2015 by Skiff-Ed.